Henry Capt , Geneve . 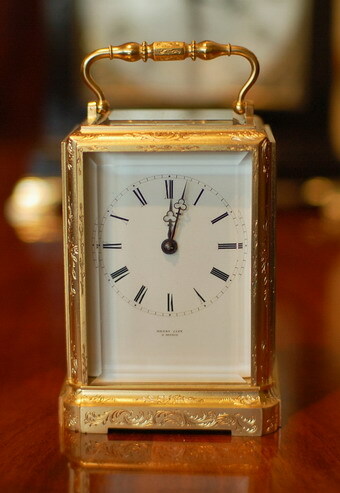 A good early carriage clock by Henry Capt of Geneve who was working circa 1840 . This is a superb example with the original , early lever platform . The clock is engraved on the back plate with the name in script along the base . The large top bevelled glass below the very ornate handle shows the escapement . A fine 8 day movement - bell striking . The case is 'one piece' design with superb hand engraving and gilding of good colour , all bevelled white glass polished inside and out . The dial showing Roman numerals and the makers name below the six with the original 'Trefoil' hands . Please view the large images by clicking through the photos . 24 month RTB Guarantee .